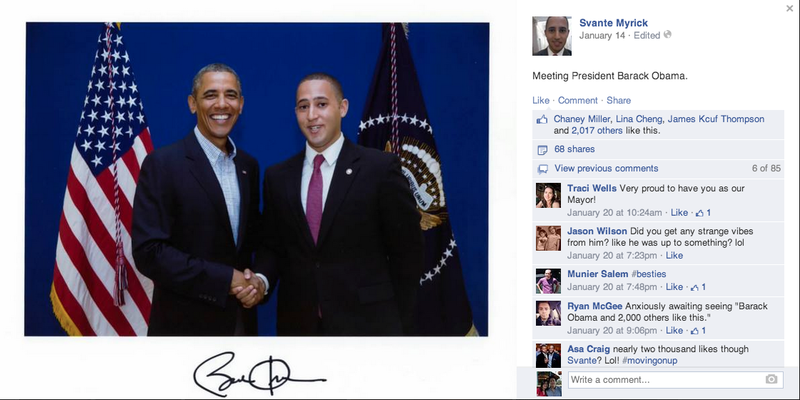 Svante Myrick isn’t a celebrity. He’s not a close friend, we were never classmates, and I’ve never even met him. But Svante Myrick is the Mayor of Ithaca, and we have one important thing in common: we both love Ithaca. About a year or two ago, I noticed on Facebook that people were “liking,” “sharing,” and otherwise drawing attention to Myrick’s posts. I had heard his name thrown around, but it only took a quick Google search to learn much more about him. At the age of 24 and freshly graduated from Cornell, he became the town’s youngest mayor and its first of African American heritage – a story which is inspiring in itself, but almost nothing compared to the personal journey of how he got there. I would strongly encourage you to read this piece by Syracuse that tells a true story of the American Dream – a boy born to a single mother, who grew up in-and-out of homeless shelters, attended public schools and then Cornell University where he became involved in public service and local politics. And now he is one of the most locally beloved public figures and sure to be a rising star. 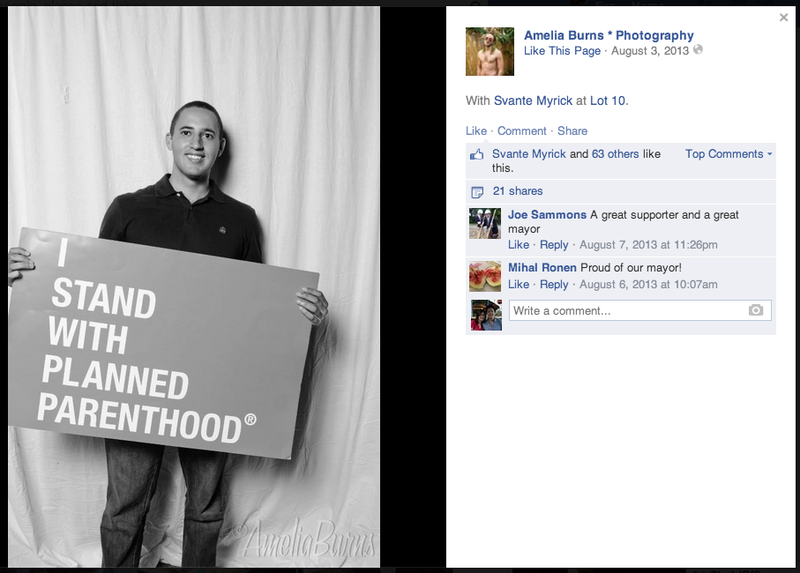 But Myrick doesn’t use his Facebook page and Twitter feed to brag about his own achievements. He uses them to draw attention to local causes, to provide news updates, and to make the occasional joke. I’ve found his posts endearing and inspiring. When Ithaca was hit by [another] blizzard in February, he recruited his roommates and offered to shovel residents’ driveways. He appended a sign “and friends!” to his parking spot labeled “RESERVED FOR MAYOR” and filled it with plants and park benches. He made this face when he met President Obama (who he cites as his greatest inspiration). He is a feminist! And he makes House of Cards jokes! 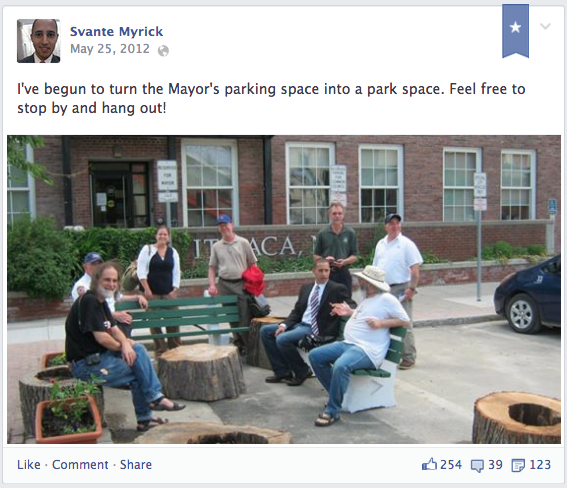 Even though I no longer live in Ithaca, following Svante Myrick on Facebook reminds me of how lucky I am to have a connection to this amazing place with amazing people. It’s easy to drown in cynicism when you pick up a copy of the NY Times and read about the state of international affairs, but it’s also very uplifting to be reminded how a single individual or a few individuals can make such a positive impact in a town and a community. This entry was posted in Current events, Ithaca/Cornell and tagged inspiring figures, Ithaca, mayor, Svante Myrick. Bookmark the permalink.